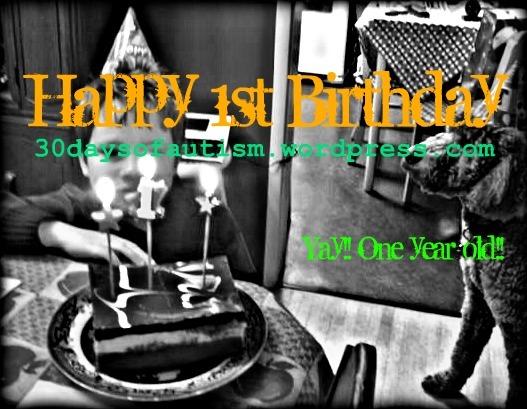 Thirty Days of Autism is one year old today: Happy Birthday Dear little blog!! We have close to 35,000 views (yes, thirty-five-thousand) and I believe this is making a difference for my child and others like him who experience the world differently. Together we’ve had the privilege of guest-posts on wonderful sites like Autism and Empathy, and interviews on CBC Radio, and on Healthy Place TV. Thank you to my friends, family, colleagues and cyber-friends who are following along with these sometimes worrisome – sometimes poignant – sometimes hilarious – sometimes just plain practical writings of mine. Your encouragement and support is very much appreciated! I have released my ideas and wonderings to the cyber-world and have been fortunate to find myself amongst an eloquent and intelligent group of people who are also advocating for those who experience the world differently. Together we are actively working to expand the reach of other perspectives in the autism community, particularly the voices of autistic adults. I am giving presentations and sharing my perspectives: speaking at schools, to university students, to educators, and in mid April – I am presenting at the University of Northern Arizona as a part of the NAzASA Autism Conference. It has been quite a year! I had intended to write about autism for 30 days – last year – for “Autism Awareness Month.” Foolish mortal that I am – I began a few days early on March 29th. A more experienced blogger would have banked those posts for later in the month. I wrote each day last April, and soon regarded my project with a growing realization that I had much more to say than I had initially expected, and also that this 30 Days of Autism project wasn’t about really about awareness… or about 30 days!! No, it was more about understanding and acceptance, and so the name of my blog has come to have a certain irony – which I appreciate very much. At the end of 30 days… my child will still need others to extend understanding to him as he experiences and process the world differently. At the end of 30 days… my child will still think differently. At the end of 30 days, as a parent supporting the emergence of H’s self-advocacy skills, I know there will be more work needed to help the world be a better match for my child. 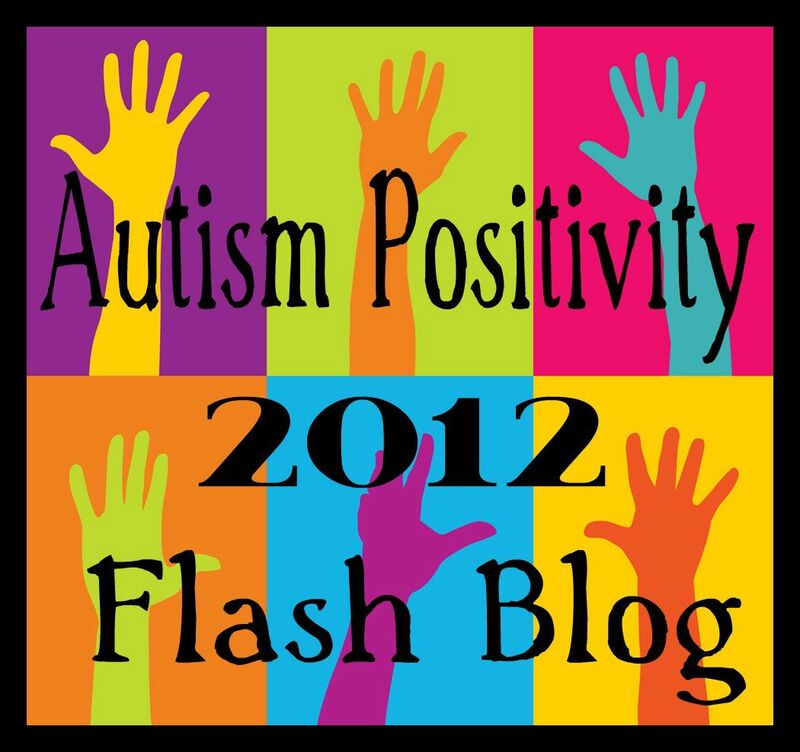 At the end of 30 days… my child will still be autistic. And yet… after these 30 days, perhaps we will have made a little shift so that the rest of the world thinks differently about neurological diversity! This week I have also had the honour of guest posting on the wonderful blog, Flappiness Is which is featuring a post about my non Autistic daughter and her experiences and reflections about being a sibling to H. I was invited to to so by Leigh, a fellow educator and mother of a child with autism/autistic child, as a follow-up to a post she had done about Glass Children (siblings to children with special or additional needs). This was the first post I read on Leigh’s blog, and I suggest you check it out: Why I wont be getting the Mother of the Year Award – Layers of understanding. It is so sensitive and honest – and you will easily see why I was immediately drawn in. It was interesting that we both seemed to discover each others’ blogs simultaneously and in a completely unconnected way. Some days serendipity just seems to be the in the air. I don’t question it… but it is nice when positive things seem to connect and collide to bring people together. For me this is relevant as it is a metaphor for the powerful experience of these past 365 Days of Autism. This action of bringing people together just fascinates me. Sometimes my role is miniscule or even non-existent – sometimes I am simply an observer – and then, there are times when my actions are instrumental in fostering connections between people. This past year I have met and interacted with many wonderful people who are parents of children with autism/autistic children, autistic adults, educators, and others. I have been positively influenced by these amazing people and their perspectives. I have done things which I had never expected when I began to write about our journey with our son and about my own learning as a parent, an educator, and well… as a person trying to make my own way. This entry was posted in acceptance, ASD, Aspergers, Autism, CBC Radio 1, diversity, Healthy Place, HealthyPlace.com, Laura Nagle, Margaret Mead, promote social understanding, sibling, Teacher, Vectors of Autism and tagged acceptance, April is Autism Awareness Month, Aspergers, Autism, blogging, Margaret Mead, One year old, parents, Perspectives, writing. Bookmark the permalink.